The river runs through us, has so much to teach us as well. 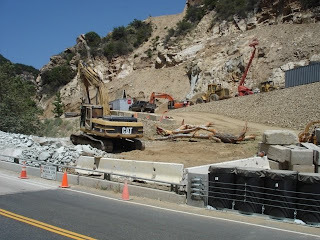 Learn more about the Ventura River watershed, including the Matilija Dam removal; steelhead trout in the Ventura River; how the OVLC is working to enhance the health of the Ventura River and how property owners on the river can help protect the river and their property. 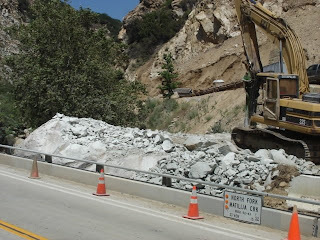 Vehicle tour : Take driving tour with Stevie Adams, OVLC restoration project manager, including stops at the Matilija Dam, the arundo removal project, and the OVLC’s Ventura River restoration projects. Meet at the Riverview trailhead of the VRP on Rice Road. On April 24, I watched as the finishing touches to the new office's entry was installed, just before the first guests arrived to tour the LEED-certified "green" building. 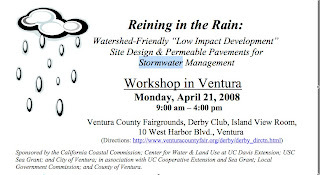 Ventura LID Workshop "sells out"
Monday April 21 - Perhaps it was well advertised, or a timely topic, but over 190 people registered for the first large-scale Low Impact Development workshop in Ventura. Over 80% of the attendees were staff from local government agencies. 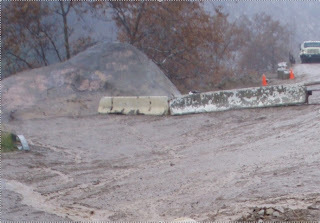 Implementation of soil-based LID systems in stormwater management, and effect on flooding, in-stream erosion, maintaining the water balance, and pollutant removal. History, evolution, and future directions for LID in the Southern California region. Combining green infrastructure and community design to protect water resources. Afternoon sessions presented pervious paving technologies for infiltrating stormwater in parking lots and other paved areas. Hopefully this information will sink in and become a part of land use planning in Ventura County. Got lots of calls on this one. 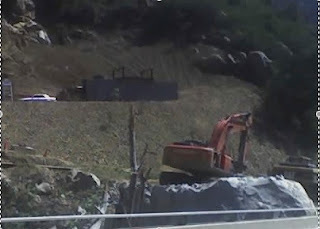 Landmark bedrock boulder jackhammered out, legacy sycamore torn up and shredded on site... all on scenic highway 33, and the last real trout steam in the watershed. 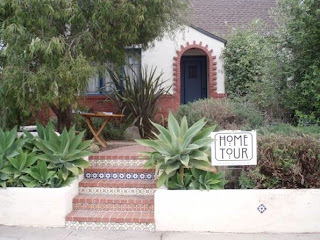 Saturday, April 19, 2008: This year's Ventura Earth Day event included an Expo at the City Lot on Sanjon Road and a Green Home and Garden Tour sponsored by the Midtown Community Council. The Expo included a large array of educational and environmental groups to explain simple and more complex steps you might want to consider to help you be a better steward of this little planet of ours. Surfrider Ventura Chapter representatives hosted a table at the Expo with information about the work we have been doing for the past 16 years. The Midtown Green Home and Garden Tour allowed residents to see what their neighbors have already done in their homes and gardens. 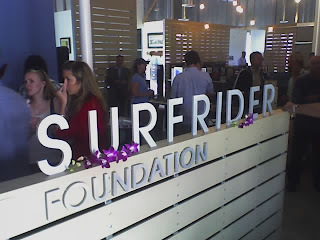 The Surfrider Foundation presented an "Ocean Friendly Garden" example to demonstrate the concepts of "CPR: Conservation, Permeability, and Retention." Throughout the day over 100 people visited the garden. The home tour included a printed guide book with descriptions of the environmental aspects of the dozen homes. 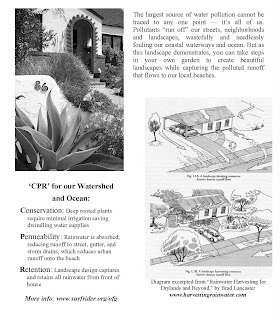 This page was published in the guide to provide an overview of the "Ocean Friendly" concept.